And it’s not just the entertainment business – retaliation occurs across industries. In fact, workplace retaliation is the No. 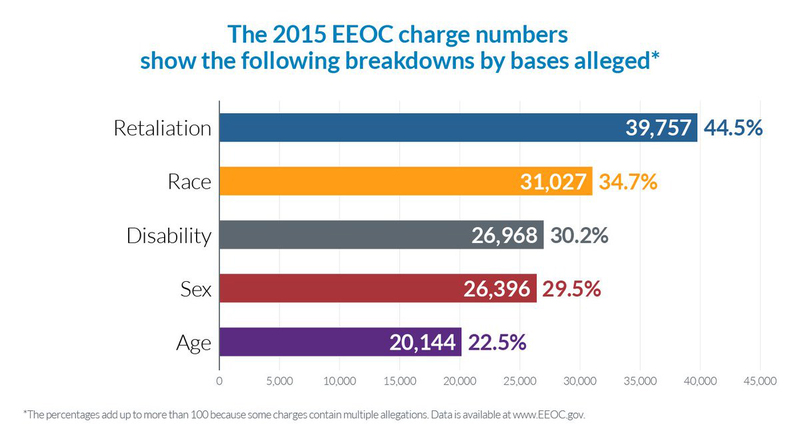 1 discrimination complaint filed with the Equal Employment Opportunity Commission (EEOC) − comprising almost 46% of all charges in 2016. The rise in retaliation claims and the wave of sexual harassment scandals this year serve as a high-priority reminder to organizations to take steps to prevent the likelihood of retaliation charges. If not, employers can spend millions to resolve charges of taking negative actions against individuals who speak up or complain about a potential violation. Workplace retaliation, like other types of discrimination, comes in many forms. Typically, retaliation occurs if an employer fires, demotes, reassigns, disciplines, harasses, bullies or takes other “adverse action” – like a change in job shift – against an employee for filing a complaint of discrimination or participating in an internal investigation. Last year the EEOC revised its “Enforcement Guidance on Retaliation and Related Issues” for the first time since 1998. The new guidelines address retaliation as it is enforced under Title VII of the Civil Rights Act of 1964, the Age Discrimination in Employment Act (ADEA), Title V of the Americans with Disabilities Act (ADA), Section 501 of the Rehabilitation Act, the Equal Pay Act (EPA) and Title II of the Genetic Information Nondiscrimination Act (GINA). The EEOC notes that employers can still discipline or terminate workers for poor performance or misconduct after the employees have filed discrimination claims. Develop a written anti-retaliation policy that makes it clear your organization prohibits retaliation. Explain what employees can and cannot do if a co-worker files a claim of discrimination, harassment or other misconduct. Include the policy in your employee handbooks. Implement a formal complaint process, including an ethics hotline where employees can report suspected incidents of retaliation. Train all managers, supervisors and employees in all locations on your anti-retaliation policies and procedures. Ensure they understand what retaliation is, how and when it can occur and how to properly respond to and report retaliation complaints. Address any concerns of employees, managers and witnesses during a pending EEOC claim or investigation. Reassure employees and witnesses of your organization’s commitment to preventing retaliation. Review and update your policies, procedures and training regularly to reflect new laws, regulations and internal changes in your organization. With EEOC claims rising, organizations should make it a priority to minimize the risk of retaliation incidents. A good start is to implement an anti-retaliation training that clearly demonstrates to employees what retaliation is and explains the personal, legal and financial harm it causes, while encouraging them to promptly report complaints, without fearing negative consequences.